There was a time, not long ago, when Virat Kohli needed to be taken under wing. He got lucky in that Yuvraj Singh, one of his buddies, a fellow flamboyant batsman, had ridden the cricketing roller-coaster, enjoying the highs to the hilt and enduring the lows with grace. He was fortunate in that his captain at Royal Challengers Bangalore, Anil Kumble, was as dissimilar from himself as possible, focussing on cricket in the staidest possible manner to the exception of all else. He was serendipitous in that he worshipped the ground Sachin Tendulkar walked on, for his batting, his commitment to being prepared and his considerable achievements, rather than looking elsewhere. And, Kohli epitomises this in a way that can scarcely be improved on. Aside from going from being super-brat to the person who sets the agenda in terms of hard work and fitness, Kohli has learnt that he is in charge of his destiny in a way that is not given to all. Rahul Dravid, on commentary at the time, was counting the balls down. It was the first Test of the series and he was more than happy to take the draw, going into the next game on even keel rather than throwing it all away. Kohli was then perceived as the anti-Dhoni. Where Dhoni was careful and calculating, accounting for the bowlers he had and their ability to pick 20 wickets, Kohli was adventurous. A Test that could have been saved was lost, but a template was born. A product of the limited-overs era, Kohli will look for a win and concede a loss rather than settling for a draw. But, the impetuous imp called Chiku, has since developed into a different cricketer. He will start a day’s play with R. Ashwin bowling to an England batsman with a long off in place or use Ishant Sharma with point and third man on the ropes. In leading the Indian team for a bit, perhaps the young man, who has grown a beard, has also understood that his predecessor knew the score. Expecting Kohli to be contrite, and tell Dhoni he was right all along may be a bridge too far, but actions speak loudest, and this is already a reality. The fields Kohli sets are more realistic, occasionally even defensive, but, sometimes that’s the only way to win a game. As a batsman, and captain-batsman, Kohli is a game-changing maverick. Typically, India follows the school-team policy of anointing the best batsman in the team captain. Kohli is the latest in the long line of choir-boys singing the right symphony. But, unusually, he wears the responsibility of leadership lightly enough to let his bat do the talking. Since 1990, when Mohammad Azharuddin took the reins in Christchurch, India has had batting captains, barring Anil Kumble and Dhoni, and the impact of leading the team on their own performances is notable. While Azhar averaged 45.03 overall, he registered 43.93 as captain; Tendulkar’s respective numbers are 53.78 and 51.35; Ganguly’s are 42.17 and 37.66 and Rahul Dravid 52.31 and 44.51. But what of Kohli? In 31 Tests he played under someone else, Kohli scored his runs at 41.13 and could not once cross 169. Forget about international cricket, he had not made one first-class double-century. Since taking over, Kohli has three double-hundreds, and averages a mean 63.96, nearly 14 runs better than his overall numbers. While it would be ignoble to impute that the captains who came before him were inferior it would be silly to ignore the fact that this young man is not burdened by being asked to lead, but rather, thrives in that position. Purely in terms of productivity, Kohli is well on the way to becoming India’s best batting captain. But he is no fool, and anticipates that sterner tests of his leadership await. How will Kohli deal with a Monkeygate situation, when the Indian captain said only one team was playing in the spirit of the game? How will Kohli resolve a conflict when the players and the BCCI are locking horns? How will Kohli treat himself, when the runs dry up and he still has to inspire his troops? 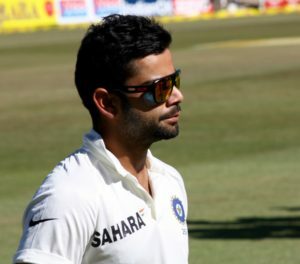 As captain of a team, Kohli has proved more than adequate, but his true test will come when he has to be a leader of men. Until such time, though, Indian cricket will make the most of a captain who is not weighed down by additional responsibility, and take as many runs in winning causes as it can possibly get.